Many of us are fond of saying, sarcastically, that somebody who is ill-informed and won’t face reality must think the Earth is the center of the universe. Well, apparently there is a bunch of these people. The group says the Earth is the center of the universe and everything revolves around us. And you, yes, you, can go to a conference in November in South Bend, Indiana to learn more about this uh, breakthrough. Let's not let facts get in the way of beliefs: Geocentrism is back in fashion? 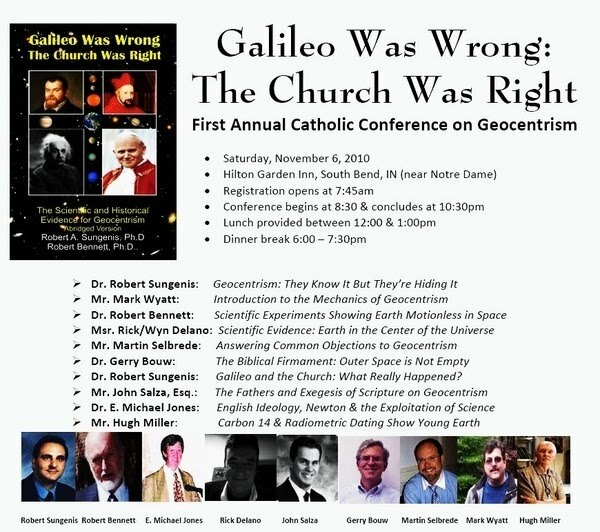 Ignoring science and even the fact the Catholic Church changed their minds centuries ago, this bunch of wahoos says Galileo was wrong. Geocentrism is the way to go, the group says. I still suspect in the back of my head that this whole thing is a hoax, from one of those Web sites who prey on people’s ignorance to whip them into a frenzy, just for laughs. You know, jazz up the types who think Darwin is a fake, the earth was created 6,000 years ago, that the End Times are coming in about an hour, and women ought to be slaves. Or something. Still, there is a Web site called geocentrism.com which offers “evidence” that the earth stands still and we are at the center of the universe. Aren’t we special? “Astronomy has not disproven geocentrism,” says the Web site. Yup, and there’s always the chance that unicorn herds roam the woods near Hardwick, Vermont, little green men live on Pluto, and I’m capable of picking up a 747 and throwing it like a paper airplane. This entry was posted on September 16, 2010 at 10:31 am and is filed under Uncategorized. You can follow any responses to this entry through the RSS 2.0 feed. You can leave a response, or trackback from your own site.